"...clear validation of the law of diminishing returns in high-end audio." Sound "A very smooth sound with an astounding amount of low-frequency extension" -- "amazing performance from a single 5 3/4" woofer in a small cabinet." "The midrange was rich but not cloying -- very good overall." "The Focus 110s tended to be quite revealing and favored well-recorded music without compensating for bad recordings." [Dynaudio's] Audience line." "The driver complement consists of a 1 1/8" Esotec+ D280 soft-dome tweeter and a 5 3/4" Esotec+ 15W-75 midrange/bass driver made of Magnesium Silicate polymer with an oversized, lightweight aluminum-wire voice coil and a double-magnet motor system." Use "The Focus 110s are quite dependent on rear- and side-wall reinforcement to sound full, and any attempt to place them too far into the room can result in anemic sound devoid of any meaningful bass." Value "Relative to their competition, the Focus 110s represent tremendous value." As an audio enthusiast I have always dreamed about listening to music in a purpose-built room, but due to various constraints, my so-called "dedicated listening room" ended up being a spare bedroom. I'm sure many of you can relate. Typical of many other spare bedrooms in a majority of suburban, middle-income homes in the States, my room is quite small, measuring just 13'L x 10'W with an 8' ceiling. Consequently the only speakers that work well in this space are minimonitors or stand-mounted loudspeakers. Minimonitors have many advantages. They tend to be light and small compared to their floorstanding brethren, so they are easy to handle and position in a room. They usually project very precise images and are exceptionally adept at the disappearing trick whilst throwing a holographic soundstage -- qualities that many serious listeners desire. They encourage nearfield listening, which, in many cases, can negate the effects of poor room acoustics, as the reflective room surfaces between the speakers and the listener are minimized. They also tend to cost significantly less than floorstanders while offering a bulk of their performance -- their main drawback being limited low frequency output and restricted dynamics, especially in large rooms. Last, but most important, they usually score high in the spouse-approval department due to their diminutive physical presence. Given my room, I have been on a lengthy quest to find well-suited speakers for smaller spaces. So it was with great enthusiasm that I received the Dynaudio Focus 110s for review. I looked forward to putting them through their paces and hearing if they offer something that other such speakers do not. Dynaudio is a well-known maker of drivers, with many high-end speaker manufacturers sourcing tweeters, midranges and woofers from them. A small list of companies currently using Dynaudio drivers includes EgglestonWorks, Totem, Merlin and Silverline. They also have supplied drivers in the past to Wilson Audio, Sonus Faber, Thiel, Duntech, Dunlavy, Cello, Paragon, CAT, Ruark, PMC and many others. But Dynaudio also manufactures its own loudspeakers and has a large lineup of models at various price points -- starting at the entry-level Audience line and moving to the drool-inducing flagship Evidence series. The object of this review is the smallest model from the Focus line, which is the series directly above the Audience line and includes another minimonitor (the Focus 140), a floorstander (the Focus 220) and a center-channel speaker (the Focus 200 C). All are magnetically shielded, making them suitable for home-theater or two-channel audio use. The Focus 110s are not very large, measuring a mere 6 3/4"W x 12"H x 11 1/4"D, but they are surprisingly heavy relative to their size, weighing in at 16 pounds each. The finish of the speakers that I received is a black-ash real-wood veneer, which is extremely attractive and will blend well with fine furniture. Other available options are rosewood, cherry and maple. On the whole, the speakers are very aesthetically pleasing, the Dynaudio logo proudly displayed on the front bottom. The sides of the speakers are gently sloped to the rear in order to prevent the detrimental effects of unwanted internal resonance. A knuckle-rap test on the cabinet yielded a solid thuk, highlighting robust construction, which, indeed, Dynaudio considers a basis of the Focus 110's design. Additionally the baffles edges are chamfered at 45 degrees and the speaker grille is mounted slightly away from the baffle. These details assist in reducing undesirable diffraction patterns. The driver complement consists of a 1 1/8" Esotec+ D280 soft-dome tweeter and a 5 3/4" Esotec+ 15W-75 midrange/bass driver made of Magnesium Silicate polymer with an oversized, lightweight aluminum-wire voice coil and a double-magnet motor system. In addition the mid/bass driver employs a diffraction-optimized cone, which is claimed to aid imaging, so a true three-dimensional soundstage is projected even at close listening proximity. Of course, Dynaudio manufactures all of these drivers in-house in Skanderborg, Denmark. The Focus 110's crossover features a simple first-order filter that transitions from tweeter to woofer at 1600Hz. The sensitivity of the 110 is specified as 85dB at 2.83V at 1m with nominal 4-ohm impedance. I was a little concerned about the low impedance value and the effects it may have on amplifier performance if it were to dip below 4 ohms, but Dynaudio assures potential buyers that the crossover is impedance-corrected, so the speaker's impedance will never fall below 4 ohms. One still needs to be careful to partner these speakers with an amplifier that is stable into a 4-ohm load. The IEC long-term power handling of these speakers is said to be greater than 150W, and the frequency response is stated to be 45Hz-25kHz (+/- 3dB). Connection to the speakers is made via a single set of high-quality WBT terminals. The Focus 110s are rear-ported designs, and foam plugs are provided if the bass becomes overpowering due to close room-boundary placement. The speaker's manual is very informative and well written. It includes placement tips and other guidelines to aid in making the Focus 110s sound their best. It recommends that the speakers be broken in before use and also suggests removal of the grilles for optimum sound. My system consists of a Marantz SA-8260 SACD/CD player feeding a Musical Fidelity X -10V3 tube buffer, which in turn feeds a Musical Fidelity A-324 upsampling DAC. My preamp is a ModWright SWL 9.0 SE feeding a pair of Quicksilver Mid-mono monoblocks outfitted with Electro Harmonic KT90 power tubes, which are good for 60Wpc from the amps' 4-ohm taps. B&W Nautilus 805s are my speakers of choice. Occasionally when I desire more power, I use a Parasound HCA-1000 A solid-state amplifier in place of the Quicksilver amps. An additional source is a Sansui TU-717 tuner for FM broadcasts. Audio Art Cable IC-3 interconnects and PS Audio X-stream Plus speaker cables complete the system. Accessories include Finite Element Ceraballs, Shunyata Research Diamondback power cords, a PS Audio high-current Ultimate Outlet, a Plateau Audio rack, and Sound Organization 24" metal speaker stands filled with sand. A trio of Echobusters sound-treatment panels line the space behind the speakers, which are arranged on the longer 13' wall of my room. My listening position is 7 1/2' away from the speakers. All my listening was done without the grilles and the rear ports unplugged. In deference to the Focus 110s' size, I initially started by placing the speakers on the 24" stands, which placed the tweeters level with my ears at the listening position, and 16" from the front wall and 20" from the side walls. This relatively close placement exaggerated the bass frequencies, so I pulled the speakers out into the room by an additional 16" from the front wall and 6" from the sides. The sound smoothed out nicely. The Focus 110s are quite dependent on rear- and side-wall reinforcement to sound full, and any attempt to place them too far into the room can result in anemic sound devoid of any meaningful bass, a fact that was made painfully clear when I pulled them in too far from the side walls. Additionally I toed in the speakers slightly toward my listening chair to dial in the soundstage and focus the imaging. The Focus 110s came with a note that they were already broken in for the review, but the amount of break-in time was not specified. Upon hookup, I was accosted by an unruly sound, with high frequencies that were unduly emphasized and bass that was slow and plodding. I contacted Michael Manousselis of Dynaudio North America and he recommended 200-250 hours of break-in for the speakers to sound their best. So I let them run continuously for approximately 200 additional hours, and the sound improved tremendously. Initial listening to the Focus 110s revealed a very smooth sound with an astounding amount of low-frequency extension, which caught my attention immediately. The bass was of good quality too -- tight and taut, no flabby, boomy, one-note bass here. One of my favorite tracks to test the quality of bass is "Pieces" from Patricia Barbers Verse [Blue Note 2435-39856-2]. Joey Barons visceral drumbeats filled my small room with so much authority that it almost sounded like a subwoofer had been added to my system. Just to verify the Focus 110s' low-frequency rating, I used a test disc that I made off the Internet, along with a Radio Shack SPL meter -- not exactly scientific equipment, but telling just the same. At my listening position, the Focus 110s comfortably exceeded their 45Hz rating, with negligible attenuation at 40Hz and audible extension all the way down to 34Hz, albeit at a much-reduced level. This was amazing performance from a single 5 3/4" woofer in a small cabinet. Listening to "Fare thee Well Northumberland" from Mark Knopflers Ragpickers Dream [WB 9362-48318-2], Knopfler's distinctive gruff voice came through with extreme clarity, highlighting the speakers excellent performance in the all-important midrange. The midrange was rich but not cloying -- very good overall. The forte of most small speakers lies in their imaging and soundstaging capabilities, and within that context the Focus 110s performed better than any speaker that I have heard in my system. They disappeared completely while throwing a deep and wide three-dimensional soundstage that transcended their locations. Listening to the Dave Matthews Band's "Two Step" from the Crash CD [RCA 7863-66904-2], I heard a deeply layered soundstage that exceeded the physical boundaries of the speakers by a good two feet or so in the lateral plane. Also, the dense instrumental mix of this track did not faze the 110s; they maintained their poise throughout, delineating each instrument clearly in space and never sounding harsh. I have heard this track on lesser speakers and at times all the instruments seemed to meld into a cacophonic glare. The Focus 110s tended to be quite revealing and favored well-recorded music without compensating for bad recordings. I would characterize the Focus 110s as neutral-sounding speakers without undue emphasis to any part of the frequency spectrum. Also at no point during the review period did I feel that the 4-ohm impedance was causing any distress to my tube amplifiers. However, at times, especially when I wanted to rock flat out, I felt that their relatively low sensitivity interfered, and the speakers refused to go any louder with my amps. The speakers did not sound congested or distorted; they just stopped getting louder. This only happened at fairly loud levels that would not typically be representative of normal playback volume. When I switched amplifiers to the solid-state Parasound HCA-1000, which outputs 200 watts at 4 ohms, this became a non-issue. Nevertheless, you should not mate the Focus 110s with flea-powered amplifiers, such as some SET designs. The Miles Davis classic Sketches of Spain [Columbia/Legacy 7464-65142-2] has a lot of high-frequency energy because of a profusion of brass instruments, and with the wrong speaker/amplifier combination it can be quite grating on the ears. The 110s performed admirably with this CD, the Esotec+ soft-dome tweeter sounding smooth and airy, though I detected an occasional trace of spittiness. Diana Kralls seductive and husky voice from her Girl in the Other Room CD [Verve 02498-61533] came through with startling immediacy, especially on "Temptation." While listening to this CD, I felt at times transported to an intimate jazz lounge, listening to Krall live. In fact, during the majority of my listening sessions, the Focus 110s compelled me to sit back and relax, making note-taking for this review a chore. This is always a good sign that a component is doing right by the music. 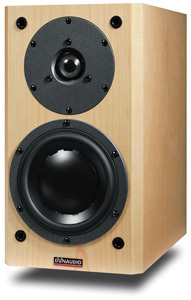 My reference B&W Nautilus 805s retailed for $2000 per pair when I purchased them a few years ago. I expected that the $600 price difference between them and the Focus 110s, along with larger size of the 805's cabinet and the speaker's 6 1/2" Kevlar woofer, would tip the scales heavily in the favor of the B&Ws, at least in the bass region. Well, I was in for a surprise. The Focus 110s' bass had more slam and was more fleshed out and taut. The difference was not gigantic, but enough to make me sit up and take notice. Suddenly most of the pop recordings that I listened to sounded a little better due to a better low-end foundation. The 805 is a front-ported speaker, so for the rear-ported Focus 110s the distance to the wall behind does play a more significant role in reinforcing bass frequencies. I therefore spent time repositioning the 805s after listening to the Focus 110s, and I could not recall the low-frequency impact of the 805s being as well pronounced as that of the 110s, regardless of placement. The midrange performance of the Focus 110s was about the same as that of the 805s -- rich and sonorous, but not too much of either. It was in the treble where the 805, with its highly regarded Nautilus tweeter, pulled ahead. The 805s sounded smoother and more refined in the high frequencies, especially with jazz. In terms of imaging, I preferred the Focus 110s, which allowed me to locate bass instruments because of their better low-end clarity, thus adding more detail to the projected image. Soundstage width and depth were about the same, but the 805s gave a better accounting of height. Within the limits of my tube amplifiers capabilities, the 805s tended to play louder than the 110s. Ultimately, the choice between these two speakers will depend on your equipment and the type of music that you prefer, but it is to Dynaudios credit that the Focus 110s can compare so well to speakers that cost almost 45% more (not including inflation). This is clear validation of the law of diminishing returns in high-end audio. The Dynaudio Focus 110 is an excellent transducer and easily one of the best minimonitors that I have heard, the only caveat being their ultimate loudness capability, which in my case -- and perhaps yours -- proved to be more of an amplifier-matching issue. With their superb low-end extension, these small speakers would give many similarly priced floorstanders a run for their money. Add in their excellent imaging and soundstaging capabilities and they become an even better value. Throw in outstanding midband articulation and a smooth high-frequency response and you have a speaker that makes it onto the must-audition list for anyone shopping in the $1500 price range -- and even above. Relative to their competition, the Focus 110s represent tremendous value. One can build an extremely competent and satisfying system around these speakers, which will fit very well into a modest listening space -- even a spare bedroom!